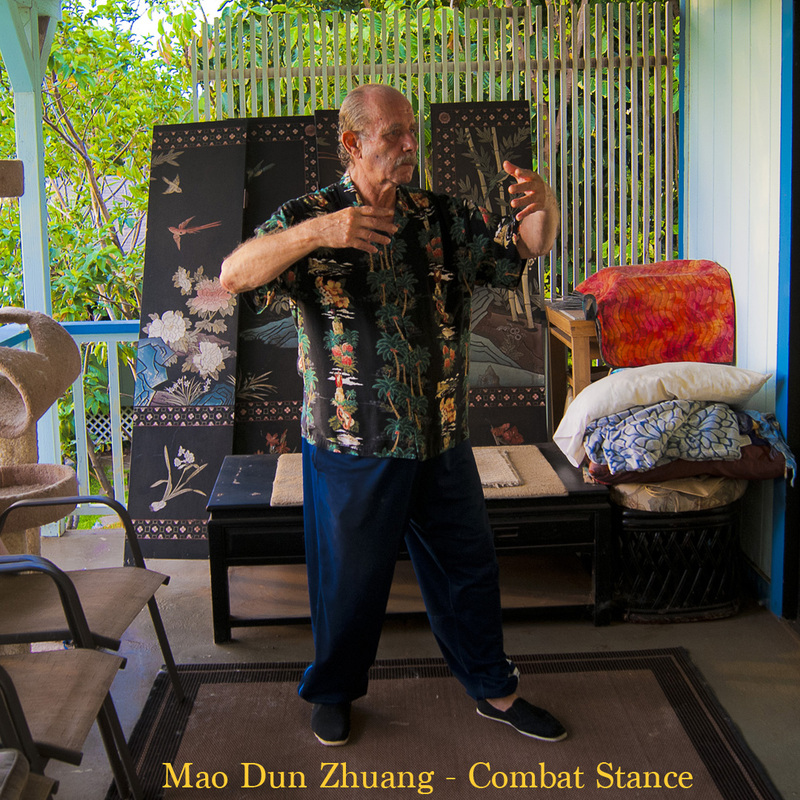 Mao Dun Zhuang or Combat Stance is an essential posture for developing martial power. Sometimes called ‘Shield and Spear,’ it is a fully back-weighted side stance which trains among other things, both lifting and sinking power. There is little or no weight on the front leg and the front heel is very slightly lifted. Because this is a martial posture, the eyes want to be open and focused way in the distance, say out to the horizon. To train lifting and sinking Jin, imagine your arms around the trunk of a tree. Next, feel you are ‘pushing’ the trunk upward (Lifting Jin) and then feel you are pressing it down, deep into the ground. (Sinking JIn) In order for this technique to be effective, your feeling-awareness must play a leading role along with your imagination. In other words you must ‘mock-up’ the appropriate feelings until they seem almost real, like you’re actually performing the two tasks. Also while training this posture one often becomes aware of the separating and combining of Yang and Yin. The Yang Heaven energy descends through the back half of the posture down through the head, neck, torso, back arm, the weighted leg and into the foot and especially into the center of the heel. 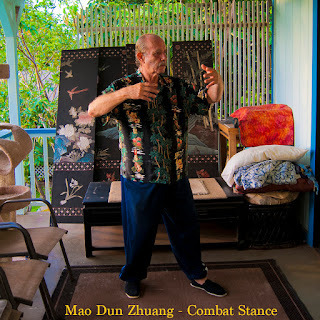 At the same time the ascending Yin Earth energy rises up the front part of the posture, from Yongquan point K-1 up through the forward leg, torso, front arm, neck and head. 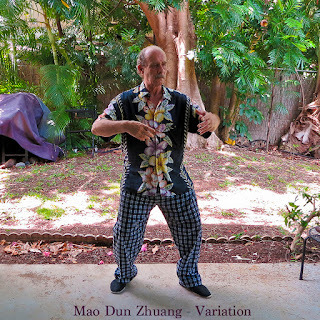 Of course, the Mao Dun Zhuang posture and it’s variation must be performed on both sides, generally 15-30 minutes per side. The primary difference between the normal posture and it’s variation is the lower position of the arms. The lower arm position really only becomes possible to do correctly when much of the body has been stretched and opened up through extensive practice of the basic posture.